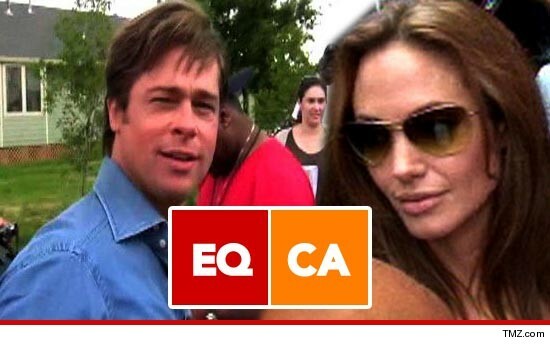 A gay rights group in California fully supports Brad Pitt and Angelina Jolie's decision to tie the knot ... even though Brangelia always swore they wouldn't get hitched until everyone had the right to marry. As recently as last September, Brad told Ellen DeGeneres, "I’ve said that we would not be getting married until everyone in this country had the right to get married." But Rebekah Orr, Communications Director for Equality California, says the group is totally behind the Brangelina marriage, even if the right to marry is still not enjoyed by everyone. She tells us, "Marriage is something that says ‘we're a family’ in a way that nothing else can ... No one has to deny that for themselves or their family to prove they are an ally and supporter of equality." Brad and Angelina finally announced yesterday they were getting married, even though they've been together for seven years and have six kids. Angelina Jolie's Ring vs. Jen Aniston's -- How They Stack Up!